The term Smokeless Fuel is usually applied to solid fuels, such as Anthracite, Coke and Charcoal. Fuel manufactured from coal, which can burn smokelessly, has made Britain's towns and cities cleaner and ended the smog's once caused by smoke. Smokeless fuels can be divided into two main categories: Natural Smokeless Fuel and Manufactured Smokeless Fuel. As the names suggest one of these fuels is a product of Mother Nature, the other is made as a result of processing the coal. 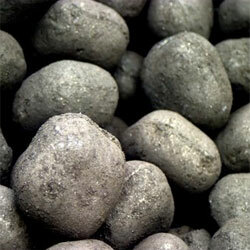 Anthracite coal is a naturally smokeless fuel and is still mined today, albeit in limited quantities. Coalite or Phurnacite are examples of manufactured smokeless fuels. Although different processes are used to produce a smokeless 'coal' the majority of these are based on reducing the volatile content (the gaseous component of the coal that creates the smoke), pulverising, curing and binding the coal/anthracite into a briquette. The warm cosy glow normally associated with coal can be enjoyed via an open fire, a roomheater, a stove, or a cooker when using smokeless fuels.